Top 10 Things to do in the Fiji Islands on the water! Our top 10 things to do in the Fiji islands on the water! If you love the water then Mantaray Island will be your idea of heaven. At Mantaray Island Resort we are committed to providing a safe and enjoyable environment. All of our Activities Team have completed the Australian Surf Life Saving bronze medallion and are fully trained in emergency procedures. We have a host of life jackets available and encourage all guests to use them when kayaking. They are also available for snorkellers who are less confident in the water. If you’re a bit nervous about being in the water then just speak to our Activities Crew who will be happy to arrange a guided snorkelling or guided kayaking trip for you. Check in with the Activities Team in the Main Bure on the beach and see what’s going on. They’re here to keep you busy and are always happy to help. 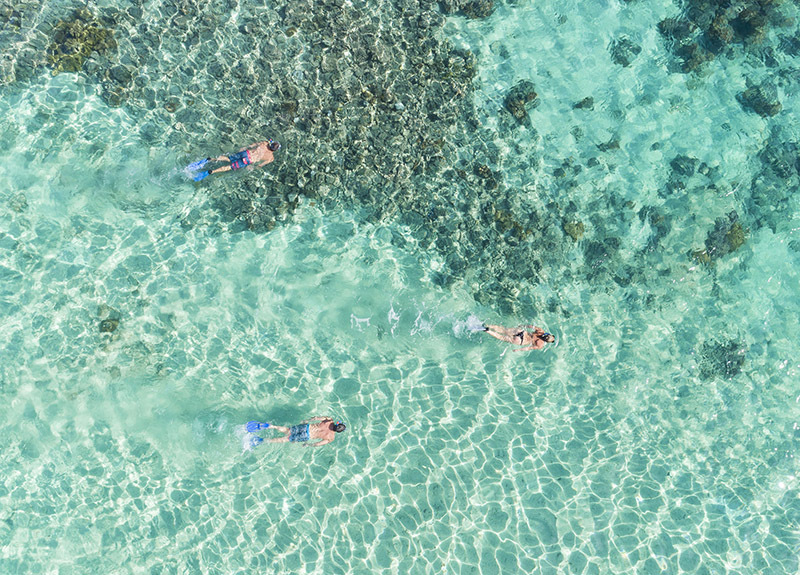 Mantaray Island Resort has some of the best off-the-shore snorkelling in Fiji and the world. You don’t have to travel great distances by boat to enjoy the very best Fiji has to offer. Simply take a few steps to the water’s edge. Enjoy star fish, enmanies, clown fish, clams, amazing coral and much more just steps from your bure. Snorkelling equipment is available for hire from Mantaray Dive on the island. Experience the majestic Manta Ray in their natural environment – truly inspiring. Trips operate ever day during the manta ray season May – Oct.
Our unique guided snorkelling trips provide insightful information on the hundreds of species of fish, corals and other marine life that inhabit the reserve directly in front of the resort. Guides can ride in kayaks to offer support and reassurance for those less comfortable with snorkelling. Guides also carry a mask and fins which enables them to collect marine specimens off the reef and allow guests to examine them before safely returning them. Guided snorkelling trips operate on demand at mid to high tide. 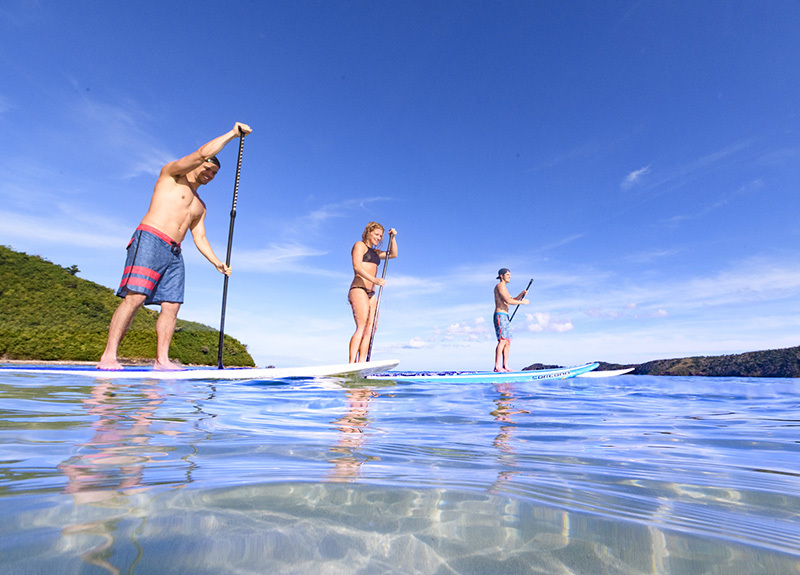 Stand up paddle (SUP) boarding is one of the world’s fastest growing water sport and our water is so crystal clear you can see straight to the bottom while paddling along. We encourage guests who are not confident swimmers to use the provided lifejackets to make their trip a safe and enjoyable one. 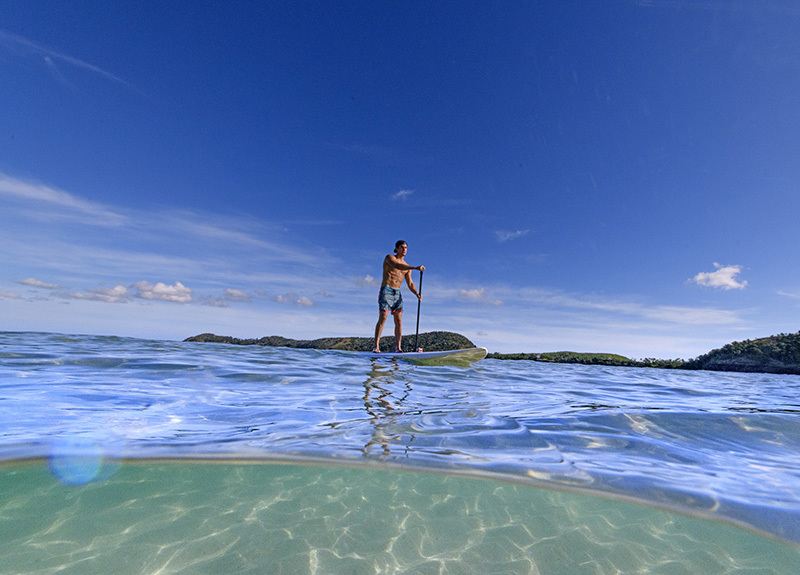 SUP boards are available for hire, from our Mantaray Dive Shop. Discover the world famous Mantaray Island Sunset Tube Cruise. Grab a few of your favourite beers, cocktails or a bottle of bubbles from the bar and head out on our world famous sunset tube cruise. Kick back with some amping tunes, a cold drink and some great company to watch the sun slowly drop off into the ocean. If lucks on your side you might even get to see the green flash! If you want to try your hand at catching your own dinner, hand fishing adventures go most afternoons, weather permitting. Grab a few cold drinks from the bar and head off in to the afternoon sun as we troll the nearby reefs and try our luck. 4hrs charter (minimum) : FJ $800 and FJ$200 every hour after that. Max 4 guest 2 crew. All tackle, bait, water and soft drinks provided. BYO food/alcohol or Mantaray Island can supply upon request. Please note: Any lost broken gear due to mistreatment will be replaced at the guest’s expense. Gain your SSI open water dive certificate. 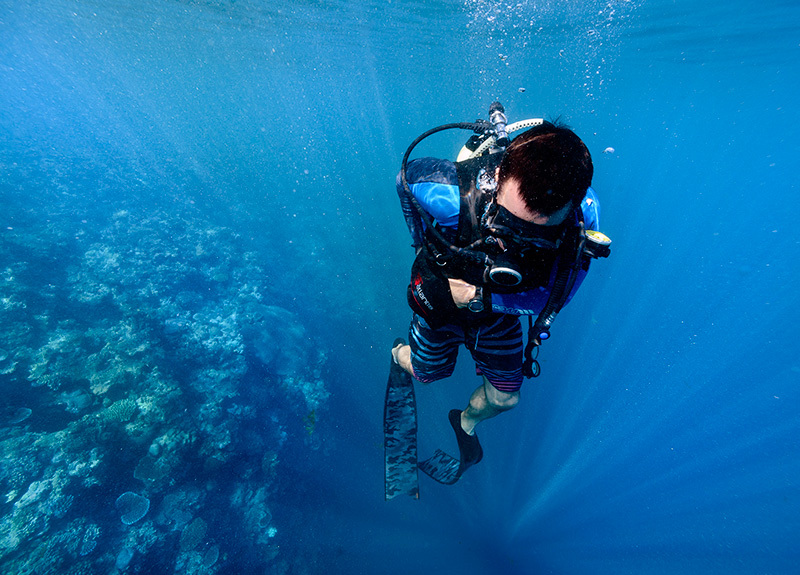 Just like PADI, SSI dive qualifications allow you to dive anywhere in the world. Course can be completed in three or four days, it’s entirely up to you how quickly you want to complete your course. If you’d rather spend your time playing in our amazing environment than reading a theory book, follow the link and complete your theory work on-line before coming to the resort. Over three or four days spent with the Mantaray Dive Team we will make you a Certified Diver for a lifetime. If you don’t have time to do a course or not sure if it’s your cup of tea, try an Introductory Dive, ideal for people wanting to experience our amazing underwater environment but don’t hold a valid dive certification or have never dived before. For the more experienced diver, there are more than 40 amazing sites located within minutes of the resort popular dives include night dives, cave dives and shark dives – Mantaray offers some of the best diving in the world. Mantaray Island Resort has recently become Fiji’s first accredited SSI Freediving operator. 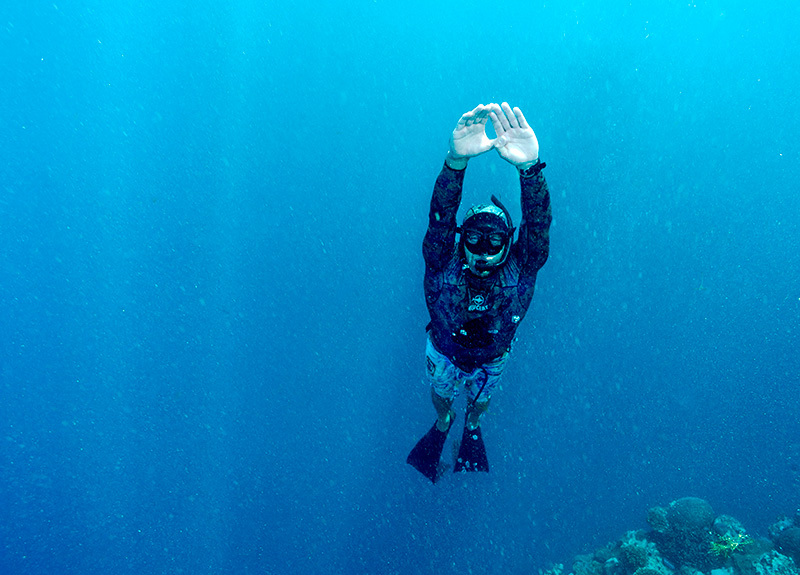 You have the opportunity to learn the art of freediving and over a two to three day period while exploring the pristine waters of the Yasawa Islands. During the manta ray season (May – October) guests will also have the opportunity to use their new acquired skills to freedive with manta ray. We offer two different types of spearfishing in Fiji experiences, one is reef or green water spearing and the other is blue water spearing. Within 5-20 minutes of the Mantaray Island Resort, the Yasawas offer some spectacular reefs and reef fish ranging from coral trout, mangrove jack, job fish, GT’s, spanish mackerel and cray fish. The perfect place to learn to spear or deeper reefs for the more experienced Spearos. The blue water spearing trips take you further away from the resort and take you to the edge of the shelf where the reef drops away to depths of 2000m. You can expect to shoot wahoo, yellowfin tuna, dogtooth tuna and mahi mahi. Blue water is for your more experienced Spearfishman. Unchartered and untouched blue water just 20-30 minutes from Mantaray Island Resort give the chance to catch the fish of a lifetime. 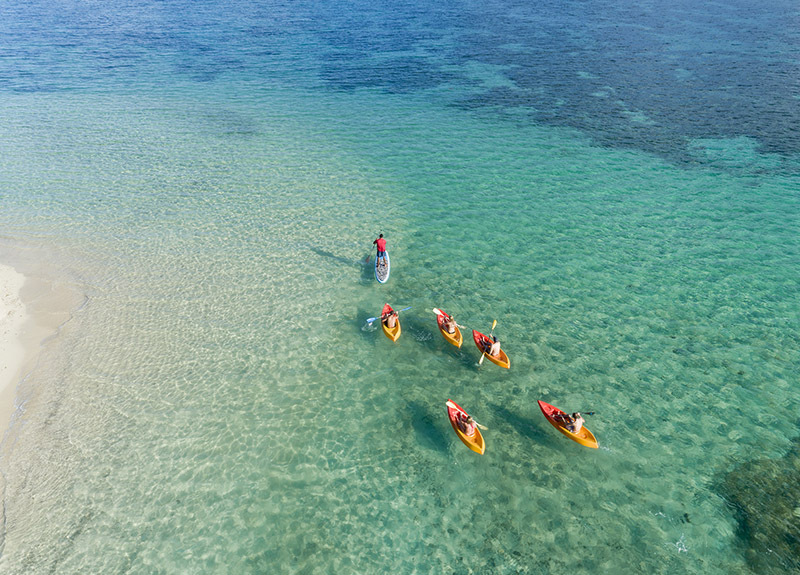 The waters surrounding the Mantaray Island Resort provide idyllic kayaking conditions. There are a large number of kayaks available for you to use at any time free of charge. We encourage those who are not confident swimmers to use the provided lifejackets to make their trip a safe and enjoyable one. For safety reasons we do restrict the area guests can kayak in. For guests that are less confident or want to gain more of an insight in to the area, we also offer guided kayak trips. Guided kayak trips explore the surrounding Islands and remote beaches with your very own local guide. Our guides will intrigue you with local legends and the history of our unique area. Guided kayak trips operate on demand please see our friendly activities staff. Swim with the Manta Rays!